Few events are as spectacular as that of a Saturn V at liftoff en route to the moon. In fact, the commanding role of the mammoth vehicle has tended to obscure its supporting players, the Saturn I and Saturn IB boosters. Chapter 11 recapitulates some of the milestones of these earlier rockets and describes some of the payloads and visual instrumentation used in early launches to acquire crucial information about the near-Earth environment and the behavior of exotic propellants in the weightlessness of space. Perhaps the biggest gamble of the Apollo-Saturn program rode on the launch of AS-501, the first Saturn V to lift off from Cape Kennedy. The decision to go "all up" on this launch circumvented the costly and time-consuming process of incremental flight testing of each stage prior to launching a complete vehicle. This mission, followed by troubleshooting the problems of AS-502, the first manned Saturn V launch (AS-503), and the first lunar landing mission (AS-506, or Apollo 11), constitute the highlights of chapter 12. The Saturn I flight tests were uniformly successful, and the unique size and complexity of the clustered rocket made its success all the more remarkable. Midway in the Saturn flight test programs, Dr. F. A. Speer, Chief of MSFC's Flight Evaluation and operational Studies Division, Aero-Astrodynamics Laboratory, summarized the first five flights (which included the first live two-stage vehicle, SA-5); a summation that turned out to be a prognosis for all 10 vehicles of the Saturn I series. "All five flights were complete successes," Speer reported, "both in achieving all major test missions and in obtaining an unprecedented volume of system performance data for flight analysis." Speer asserted, "It is correct to state that, up to this point, no major unexpected design change had to be initiated on the basis of flight test-thus proving the design maturity of the Saturn I vehicle. "1 Troubles occurred, to be sure; but they did not cause serious delays in the mission schedules, nor serious redesign efforts. The 10 launches of the Saturn I booster included both Block I and Block II versions. The H-1 engine was common to all the vehicles, but a number of significant differences distinguished Block I from Block II. The most visible distinguishing feature for the Block I series, SA-1 through SA-4, was the absence of aerodynamic fins on the first stage. Moreover, the Block I vehicles did not include live upper stages. Consistent with NASA's building block concept and the requirements for validating the clustered concept first, these first Saturn I launches used live lower stages only. The dummy upper stages looked like the future live versions, had the same approximate center of gravity, and had identical weight. Inert S-IV and S-V stages, topped by a nose cone from an Army Jupiter rocket, brought the typical height of the Block I series to about 50 meters. The flight of SA-1 was remarkable for the small number of modifications that were required for succeeding flights. 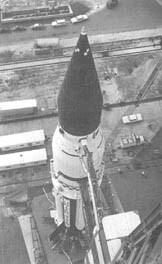 Experience gained from successive launches inevitably resulted in changes, but the only major difficulty that turned up with SA-1 was an unanticipated degree of sloshing of propellants in the vehicle's tanks. Beginning with vehicle SA-3, additional antislosh baffles were installed, which brought this undesirable characteristic under control. None of the Block I missions called for separation of the upper stages after the S-1 first-stage engine cutoff, although the SA-3 and SA-4 vehicles experimentally fired four solid-fuel retrorockets, anticipating the separation sequence of Block II missions. Other preliminary test items on SA-4 included simulated camera pods and simulated ullage rockets on the inert S-IV stage. The last two vehicles also carried a heavier and more active load of electronics and telemetry equipment. The telemetry equipment and associated test programs varied with the goals of each mission, but the total array of such gadgetry and the means of acquiring information help explain not only the success of the Saturn program but also the comparatively low number of R&D flights required to qualify the vehicle as operational. The flight of SA-4 culminated with only seven engines firing instead of eight. One of the appealing features of clustered engines involved the "engine-out capability"-the prospect that, if one engine quit, the remaining engines could compensate by burning longer than planned. So NASA technicians programmed a premature cutoff of one engine 100 seconds  into the flight. The experiment succeeded, the SA-4 performing as hoped on the remaining seven engines. During 1964, introduction of the Saturn I Block II vehicles marked a new milestone in large launch vehicle development. To the casual observer, the most obvious distinction was the addition of the eight aerodynamic fins to the lower stage for enhanced stability in flight. 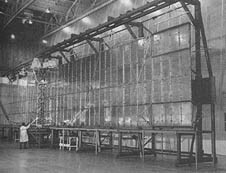 As far as NASA was concerned, the most significant feature of Block II was the addition of a live upper stage, the S-IV, built by Douglas. Moreover, the S-IV stage also marked the inauguration of liquid hydrogen propellant technology in the Saturn vehicle program; six RL-10 liquid hydrogen rocket engines supplied by Pratt & Whitney were used. These engines in the upper stage would allow orbital operations for the first time in Saturn I launches. Above the S-IV stage, the Block II vehicles also carried the first instrument canisters for guidance and control. The instrument canister controlled the powered ascent of the big rocket and carried an array of sensing and evaluation equipment for telemetry acquisition from the ground. Top left, Saturn I SA-4 rises from the launch pad on 28 March 1963. The last of the Block I vehicles, it has no aerodynamic fins as does SA-5, which sits on the pad at top, right. 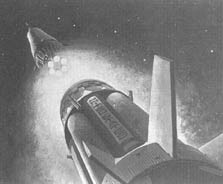 At left is an artist's conception of S-I V stage separation in space, with the six RL-10 engines kicking the payload into orbit. Television was originally selected for use on rockets because recovery of motion picture film seemed uncertain. Still, the TV units had limitations because a number of critical vehicle functions were not compatible with television camera operations and imagery. For this reason, the Saturn I flights also incorporated motion picture coverage of test flights. A technique to incorporate such coverage was successfully demonstrated during the Redstone program in 1961 when inflight photographic instrumentation captured the separation of a warhead from a Redstone rocket booster. Early in the Saturn development program, investigators recognized the need for a similar photo system for visual analysis of phenomena that could not be simulated during ground testing or acquired through vehicle telemetry. Plans provided for inflight  motion picture and television coverage for the first stage of the SA-1 mission in October 1961 on the basis of the Redstone camera technology. Lack of time and money prevented use of such equipment for the first Saturn launches, and effort was redirected toward the mission of SA-5, the first live, two-stage Saturn I. Responsibility for the camera became a joint program of MSFC's Astrionics Laboratory and the Propulsion and Vehicle Engineering Laboratory. With approval for the project in October 1961, Marshall named Cook Technological Center, a division of the Cook Electric Company of Chicago, as the major contractor. Cook Technological Center then proceeded with the development and manufacture of jettisonable and recoverable camera capsules to be flown on SA-5, 6, and 7. 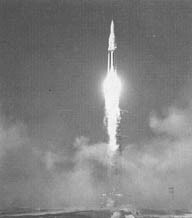 The launch of SA-5, 29 January 1964, was what NASA liked to call "a textbook launch." 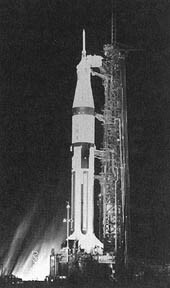 As the first Block II vehicle, the SA-5 recorded a number of firsts: first S-IV stage to fly, first guidance and control packages, and first successful stage separation. The SA-5 was the first Saturn using uprated engines, marked the first successful recovery of motion picture camera pods, and was the first orbital Saturn vehicle. To carry the Pegasus aloft, the S-IV second stage and the instrument unit underwent some minor modifications. Because heat absorption could upset the satellites thermal balance, Douglas supplied the S-IV with a special coat of paint to reduce the heating factor. New equipment consisted of an "auxiliary nonpropulsive vent system" to cut down excessive tumbling and enhance the orbit stabilization. Designers also incorporated the reworked instrument unit. NASA officials scheduled the launch of SA-9 for 16 February 1965, and technicians at Cape Kennedy worked hard to meet their preflight deadlines. With the Pegasus payload shrouded in the Apollo service module and adapter, KSC personnel affixed it to the S-IV second stage on 13 January. The next day, at Launch Complex 37-B, workers finished mating the Apollo command module to the AS-9 vehicle. In their drive for flawless operations, NASA and contractor personnel continued to tinker with the satellite right up to the last minute. On 14 February, only two days before the launch, technicians from MSFC and Fairchild made final changes in the meteoroid detection subsystem. On 16 February, the Saturn I vehicle SA-9 successfully lifted off from launch Complex 37-B with NASA's largest unmanned instrumented satellite to date. It was the first time a Saturn rocket had been used to loft a scientifically instrumented payload into space. In a flawless mission, the Saturn I put Pegasus into orbit, and inserted the command module into a separate orbit where it would not interfere with scientific measurements. A remotely controlled television camera, mounted atop the S-IV second stage, captured a vision of the eerie, silent wings of Pegasus I as they haltingly deployed. Above, a Fairchild technician checks out the extended Pegasus meteoroid detection surface in March 1964. At right is an artist's conception of Pegasus in orbit with meteoroid detector extended. In terms of rocket development, the series of Saturn I launches was remarkably successful. Most rocket programs had severe teething troubles early in the game; up to two or three dozen test shots and loss rates of 50 percent were not out of the ordinary. True, the Saturn I used engines and tanks extrapolated from earlier programs, but uprating the H-1 engine had brought difficulties, and a cluster of this magnitude was untried. Moreover, the later Saturn missions introduced a sizable new LH2 upper stage, powered by a cluster of six RL-10 engines. For all this, there seems to have been persistent criticism of the Saturn I series of launches. Basically, it appeared to be a multimillion-dollar launch vehicle program with no significant missions or payloads. Even before the launch of SA-2 in the spring of 1962, NASA had announced the Saturn V. It was this vehicle, not Saturn I, that had the mission and payload that counted: a lunar voyage with a payload equipped to land men on the moon and get them back again. As a preliminary to Saturn V missions, plans were already in progress for the Saturn IB, which would test a Saturn V third stage in orbit and begin qualification of crucial hardware such as the command module and lunar module. With hindsight, the apparently superfluous Saturn I launches still contributed to the Saturn program, underscoring the innate conservatism  of Marshall Space Flight Center. Aware of potential early failures in a launch series, MSFC evidently planned for several, but to make the series as successful as possible, Marshall also went into each launch with vehicles tested and retested to the point where the possibility of failure was virtually eliminated. Marshall's own thoroughness made the remarkable string of 10 successful launches seem unnecessarily redundant. In any case, the launches verified many concepts for systems and subsystems applied to later Apollo-Saturn missions, provided valuable experience in the operation of LH2 stages, demonstrated the validity of the cluster concept, and tested early versions of Saturn guidance and control. Payloads for the Saturn I launches may not have been as dramatic as those for other vehicles, but Saturn I missions, overall, were nevertheless beneficial. Saturn IB missions began with the unmanned launch of AS-201 from KSC Launch Complex 34 on 26 February 1966. With both stages live, the vehicle made a successful 32-minute suborbital flight, reaching an altitude of over 480 kilometers with impact into the south Atlantic about 320 kilometers from Ascension Island. For reignition under weightless conditions, fuel and oxidizer had to be settled in the bottoms of the propellant tanks. Engineers hoped to achieve this through the use of the hydrogen continuous vent system. The venting gas imparted thrust which pushed the propellants to the bottom of the tanks. This thrust could be augmented by occasionally opening the liquid oxygen tank propulsive vent valve. To study the stability of the liquid hydrogen in orbit and to check settling of the liquid hydrogen at the bottom of the tanks, the S-IVB carried a pair of TV cameras mounted inside the tank. Prior to launch, a checkout of the TV system uncovered trouble in one of the cameras. After a hold of almost two hours, NASA engineers decided not to postpone the launch any longer and the vehicle lifted off with only one of the cameras expected to work. Fortunately, the remaining camera functioned well, and the  images verified the hopes for proper propellant behavior during venting and for settling of the propellants prior to reignition. Motion picture color coverage of stage separation, recovered from the ocean in one of the camera capsules, was also of high quality and showed the desired performance. 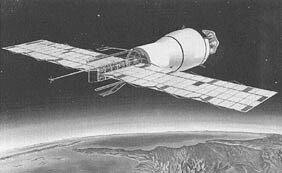 AS-202, launched on 25 August 1966, returned to the suborbital mission profile because the primary purpose was to test the heat shield on the command module (CM). Extensive holds, taking up three days, had been caused by problems with the spacecraft and ground telemetry. With the problems finally resolved, the AS-202 vehicle lifted off in a flawless launch. The S-IVB successfully tested its ullage rockets and ignited as planned despite some minor valve malfunctions in the recirculation system of the J-2. Separation of the S-IVB and the CM caused oscillatory motions of the S-IVB, which could have made for tricky maneuvers for CM docking with the lunar module (LM) in manned missions, but the S-IVB auxiliary propulsion system brought the stage back under control. In accordance with the planned profile, the CM made a "skipping" reentry to raise the heat loads and subject the heat shield to maximum punishment. Recovery of the scorched CM occurred near Wake Island in the Pacific Ocean. As Apollo 5, the original AS-204 vehicle lifted off from Launch Complex 37 at KSC on 22 January 1968 in an unmanned test of the lunar module in Earth orbit. The LM was enclosed in a spacecraft-lunar-module adapter and topped by an aerodynamic nose cone in place of the Apollo command and service modules (CSM). Evaluation of the LM included ignition of the descent and ascent stages and LM staging and structures. Engineers also intended to conduct an S-IVB propellant dumping experiment in orbit, following separation of the stage from the LM. Dumping was considered necessary to make the S-IVB safe before docking of the CSM with the S-IVB-attached LM. Some months prior to the AS-204 mission, NASA planners realized that the vehicle was going to be sitting stacked on pad 37 for a considerable period of time awaiting the arrival of the LM. NASA took advantage of the opportunity to monitor the conditions of the launch vehicle over a long period of time, as it stood on the pad exposed to the elements on the Florida coast. On 7 April 1967, the first stage had been erected; the second stage and the instrument unit were added in the next four days. Marshall and contractor personnel devised a detailed set of criteria for periodic inspections of the vehicle starting that same month. No components had to be replaced because of corrosion; advance planning had paid off. The vehicle was under constant nitrogen purges to protect the engine compartment and other equipment areas from the salty atmosphere. The vehicle propellant tanks were also kept under pressure with dry nitrogen. These procedures were maintained during a kind of musical chairs operation as the LM and its associated hardware were moved in and out, off and on, for several weeks. After arrival of its ascent and descent engines and their mating, they had to be taken apart in August to repair leaks in the ascent engine. Then the two stages were mated again until September when a new leak required demating. Several items of LM hardware had to be shipped back to the contractor for additional work. The ascent and descent engines of the LM were put together again in October, and tests were run until November when the spacecraft was taken to the pad and mechanically mated with the booster. The flight readiness tests were not accomplished with the total vehicle until late in December with the LM in position, nearly nine months after the launch vehicle had been put in place on Launch Complex 37. Above is a cutaway drawing of the Saturn IB launch vehicle. At right, the first S-IB rises successfully from KSC's Launch Complex 34 on 26 February 1966. At far right, the first manned Saturn IB, Apollo 7, is shown or the launch pad at night, poised for takeoff the next day, 11 October 1968. ....and R. Walter Cunningham. Primary objectives for the mission pertained to the CSM, crew performance, manned mission support facilities for the CSM, and CSM rendezvous techniques. With three astronauts aboard and the necessary provisions to sustain them in orbital flight, the launch of AS-205 marked again an increase in payload capability. Much of this increase came from the reduction of measurement instrumentation from the prior Saturn launches. AS-204 had required 1225 measurements; 720 sufficed in AS-205. The Apollo 7 spacecraft also was the product of extensive redesign since the disastrous fire the year before. It featured a quick-opening one-piece hatch, an extensive substitution of materials to reduce flammability, and a modification of the cabin atmosphere for testing and prelaunch operations. Even though primary attention centered on the manned aspects of the mission, NASA and Rocketdyne personnel were closely watching the augmented spark igniter lines for the J-2, which had been modified after they failed during the Apollo 6 mission on 4 April 1968 (see chapter 12). The ascent of both Saturn IB stages went like clockwork. During the boost phase of the S-IC stage, Schirra routinely reported an instrument readout of the pitch program, and noted, "She['s] running-it's getting a little noisy now." Then Schirra called out the sequence of inboard and outboard shutdown of the H-1 engines, followed by confirmation of S-IVB ignition on cue at programmed thrust levels. In between comments from Schirra that the ride from the S-IVB was "a little bumpy," flight controllers in Houston also caught Schirra's enthusiastic remark, "She's riding like a dream," and a voice from the spacecraft that "the window view is sensational. "38 After more than one hour in orbit, the instrument unit initiated the automatic "safing" sequence, which included the propellant dumping operation. Separation of the CSM from the spent S-IVB stage took place on schedule, and the astronaut crew turned the CSM around for the simulated docking maneuver (the AS-205 did not actually carry an LM). As part of the simulated LM rendezvous exercise, the CSM was maneuvered to a station-keeping position near the spent S-IVB stage as it tumbled through space. On 18 October, seven days after liftoff, the S-IVB reentered over the Indian Ocean. The three astronauts completed 63 orbits before successful reentry and splashed down into the Atlantic on 22 October, where they were picked up by teams from the recovery ship Essex. The Apollo 7 mission achieved all primary mission objectives, and the last of the Saturn IB flights was over. NASA intended the AS-201 through AS-205 flights to qualify the Apollo spacecraft, and the requirements had been met. The Saturn IB first stages had also performed as expected, but more importantly the S-IVB upper stage and the instrument unit for the Saturn V were successfully qualified in orbit.39 In less than a year, the space agency expected to land men on the moon. That mission required the giant Saturn V.
 With the exception of the S-IVB, every stage of the Saturn launch vehicles depended on clustered engines. The feasibility of large, high-thrust engine clusters was demonstrated by the first successful launch of the Saturn I and verified in one mission after another. Later Saturn I flights (the Block II series) proved the feasibility of using liquid hydrogen fuels in Saturn upper stages. The Saturn I series also provided the opportunity to perfect visual instrumentation systems and to try out evolving concepts of guidance and control as well as hardware and software tagged for the manned lunar landing program. Even though the Highwater experiments contributed little to astronautical science, the Pegasus flights yielded pertinent information that confirmed booster and spacecraft designs under way and accumulated scientific data that influenced the design and operations of later manned and unmanned spacecraft. Introduction of the Saturn IB afforded NASA the opportunity to flight-test important elements of Apollo-Saturn flight hardware. This included the S-IVB upper stage, the instrument unit, the command and service modules, and the lunar module. During the Saturn IB missions, operations planned for the Saturn V were given a trial run, including orbital coast and restart of the S-IVB and stage separation of the S-IVB and lunar module. The orbital operations and restart of the J-2 engine subjected the instrument unit to the kind of sequencing critical for future lunar missions, and advanced telemetry and visual instrumentation yielded knowledge of the behavior of cryogenic propellants (particularly liquid hydrogen) in orbit. Finally, the Saturn IB powered the first manned Apollo mission, Apollo 7. This manned, Earth-orbital mission cleared an important hurdle before the towering Saturn V lifted a similar payload and steered a course for the moon.